Pushkin 'Petu Pumpkin' is a very hungry 7-8 year old. Like the very hungry caterpillar, he, too, eats everything and anything. He, in fact, lives to eat. He is the kid who is always hungry, munching all morning, all afternoon, ... all day. Not just on his own food that he gets packed in a variety of 'dabbas' to school, but every one else's tiffins. Before you can say 'eat', the food has gone. A human vacuum cleaner for food, in short. His classmates - Jatin, Kiran, Nitin, Sachin are fed up of this constant requirement for shielding their own food from Petu's appetite. Nothing seems to work, and they end up hungry every day. So they come up with a novel idea. What is this idea? Does it work? Does Petu get cured of his excessive greed? 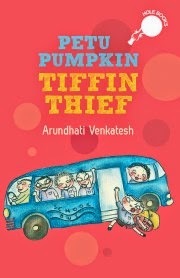 Read this hilarious book by Arundhati Venkatesh (one of our own contributors at Saffron Tree) to find out. 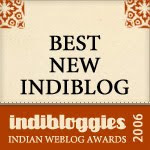 Petu Pumpkin Tiffin Thief has some memorable supporting characters, that has the reader nodding in recognition. There is Sari madam. Short for Sarita madam. Venky Sir, who keeps forgetting everyone's names, and so gives them his own names. And of course, Petu's grandmother, the masterchef who cooks all that yummy sounding food, that keeps one salivating long after the last page of the book is read, and sounds very like one's own grandmother from one's memories of childhood summer vacations. And the illustrations. Shilpa Ranade makes sure the reader gets the full significance of the number and variety of dabbas Petu carries to school. Her Sari madam certainly stayed with me. The pictorial messages sent back and forth, and the eyes in the dark in the secret society meeting. And Nitin's drawing of Daniel Sir. Lovely! There is a very distinct impression of having wandered into one of RK Narayan's Malgudi stories. One can hope for many more such gems from the author.